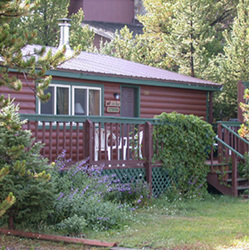 Little Bear is a cabin, rustic exterior with wide deck facing the mountains. 3 bedroom (queen beds; 1 bunk set) and 2 baths, queen size hide-a-bed sofa, thus can sleep 8. Ideal for a family or sporting group. Amenities include completely equipped kitchen, dishwasher, laundry, dining area seats 8, TV with VCR, gas grill. Located on a private lot, it faces the old airport (a snowmobile playground) and is near the Rendezvous Cross-Country Ski Trailhead. Mountain biking areas nearby. Five miles from Madison River, ten miles from Hebgen Lake, yet a mere seven blocks from Yellowstone Park and the business district of West Yellowstone. Dad can go fishing yet Mom and the kids can find lots to do in town, all with the feel of being away from it all. Directions: Private cabin located at west boundary of West Yellowstone, view to Continental Divide across old airport, 135 Iris St. adjacent to national forest. Ski or snowmobile trails out the front door. One block south of Highway 20 West, seven blocks from Yellowstone National Park. Little Bear sign at front door.